Robin, one of the most famous brands within the UK electrical testing arena and now partnered with Amprobe, is offering a new, lightweight Portable Appliance (PAT) Tester. 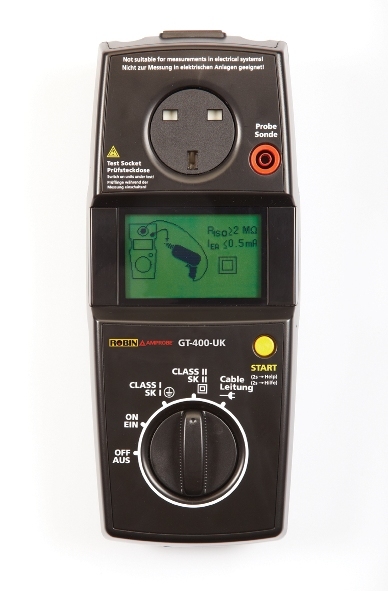 The easy-to-use Robin-Amprobe GT-400-UK PAT Tester has been developed for the commercial electrician or facilities maintenance technician to carry out a wide variety of safety measurements of electrical appliances in accordance with the IET Code of Practice and EN 61010 Safety Standards. The new, rugged Robin-Amprobe GT-400-UK PAT Tester is designed to be intuitive to use with no training required. Rugged, yet easily portable for on-the-go testing, the high quality construction and German manufacture offers years of service. The GT-400-UK instantly measures the safety and integrity of electrical appliances and IEC cables. It also measures earth ground resistance, and insulation resistance measurements at 500V. Robin-Amprobe offers a wide range of cost-effective, innovative test equipment specifically designed to make the electrician’s job faster and easier. This also includes a range of single, dual and multifunction 17th Edition Installation Testers specifically designed for the UK electrical market. Robin Amprobe products are sold and supported by a wide range of dealers and are backed up by a professional support service. Robin, renowned for electrical testing products at affordable prices, is now partnered with Amprobe, one of the most famous test equipment brands in the United States and Germany. Amprobe, throughout the last 50+ years, has become synonymous with clamp-on meters. Now with over 250 items in its product offering, Amprobe has become an established leader in quality test equipment. This vast array of products, plus the incorporation of the Robin electrical range, means the UK electrician has a one-stop shop for quality, value-priced products which include 17th Edition Installation Testers, Voltage Detectors, Multimeters, Clamp Meters, Thermometers and Cable Locators - one of the largest ranges available to the electrical contractor and engineer. More information about all Robin Amprobe products can be obtained from local wholesalers and distributors or via the new web site at www.robin-amprobe.co.uk .